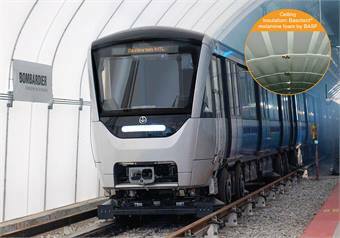 Bombardier’s new Montréal metro featuring BASF’s Basotect melamine foam for superior sound and thermal insulation. BASF’s Basotect melamine foam is now being used for thermal and acoustic insulation in the ceilings of 468 new metro cars being built by Bombardier for the next generation Montreal subway. Bombardier chose Basotect-based acoustic foam parts provided by Artik/OEM Inc., a foam converter with locations in Canada as well as the U.S. servicing Bombardier. With a density of only 9 kg/m³, Basotect helps to reduce the overall weight of the cars and thus contributes to the goals of Bombardier to enhance performance and to increase the energy efficiency of their trains. Using Basotect to replace fiberglass resulted in a 35% weight savings of the roof insulation. In addition, installation of the Basotect parts at the La Pocatière, Quebec facility is much simpler, providing time and cost savings. This is all accomplished without having to sacrifice sound absorption or on fire properties of the insulation, according to BASF.